You are currently browsing the tag archive for the ‘Janet Weight Reed’ tag. No change in internet connection! It was at this point that my old MacBook Pro died, as some of you know, and I was reduced to data roaming on my mobile which is not conducive to work or approving Janet’s painting before she sent it to Crete. I sent Janet a message, via a friend, with our address and said that I trusted her talent and instinct enough to ‘approve’ without seeing a scan! The pleasure and excitement that the painting was coming and that Mr FND knew nothing about it was indescribable. Except that it didn’t arrive before 19th December. Nor did Mr FND as there had been endless problems on the journey from London, not least the Anek Lines Ferry driver who broke the hand brake on our small van, and the impossibility of finding the new Piraeus ferry terminal in Venice. Signposts might be a good idea, especially as it still looks like an unmanned building site! Mr FND arrived on 20th December but the painting went AWOL in the Greek postal system and did not arrive until after Christmas. 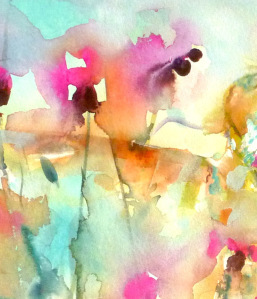 In spite of the delay, our joy in the watercolour is infinite. Janet has done a superb job, capturing a likeness of man and dog that is quite, quite remarkable, and every brush stroke expresses the loving bond between the two. Janet, you really have made us immeasurably happy and I thank you from the bottom of my heart. If anyone reading this is considering commissioning a painting for a special occasion, I cannot recommend Janet more highly. 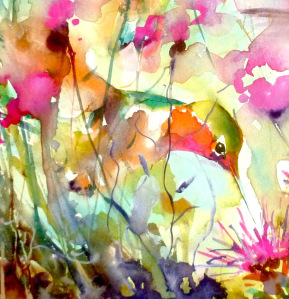 I end this post with some of Janet’s magical hummingbirds. Details create the big picture…..
I’ve had no internet connection for the last three days and sitting in the local café to get access is not kind to my disabled wreck of a body, alas. In the meantime, enjoy the beautiful watercolours of Janet Weight Reed and I’ll be with you when I can! During the middle part of my career, from 1986 til 1999, I painted large murals for corporate entities. They weren’t always paintings I was excited about, but they paid the bills and kept my tools honed, which in turn gave me freedom to paint what I wanted to paint. Something I learned, which has stood me in good stead, is that if you change one small area of a huge mural….the whole image changes. A relatively small change might not seem obvious to the viewer, but the fact is that every brush stroke added or deleted changes the rhythm and energy of a painting. And so it is with all of life.